Its been long since InFocus launched their last device in the Indian market. 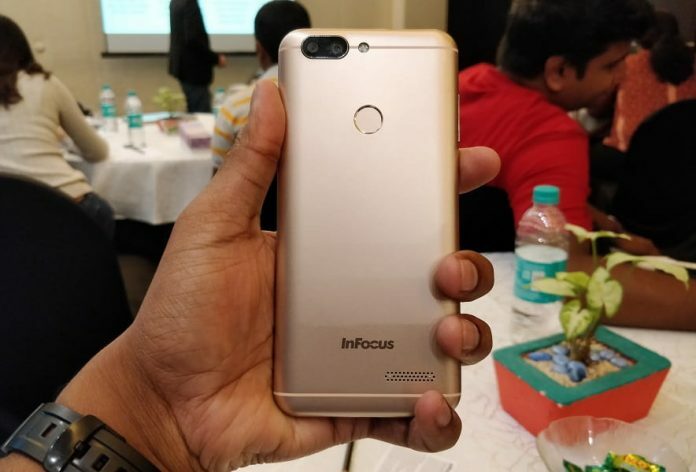 Finally, InFocus backed by the Foxconn a global leader in the smartphone manufacturing industry launched a very affordable budget smartphone in India and its called the Vision 3. InFocus Vision 3 is the budget smartphone launched yesterday on December 19, the full view display with fewer bezels, feature-rich camera, and a massive 4000 mAh battery are the prime features of this phone. Rear Camera: 13+5 Megapixel dual camera; 13MP rear camera with LED Flash, f/2.0 aperture, secondary 5-megapixel camera with 120-degree wide-angle lens, f/2.2 aperture; Phase detection autofocus, LED flash, Geo-tagging, touch focus, face detection, panorama, HDR, Portrait Mode, Manual Mode, and Time-lapse. Front Camera: 8 megapixels camera with an f/2.2 aperture; Beauty mode, time-lapse, manual mode, screen flash, HDR, and portrait bokeh. Connectivity: WiFi, hotspot, Bluetooth 4.0 A2DP, GPS, FM Radio, 3.5mm audio jack, micro USB 2.0, USB On-The-Go. InFocus Vision 3 comes with a unique camera feature called ‘Dualfie’, which is exclusively developed for the Indian consumers keeping in mind their love for photography. The feature allows clicking simultaneously from the front and rear camera to display the image together on the large screen, similar to the Nokia’s “Bothie”. I have been using the device for the last couple of days and so far I found the device a good value for money, I will post the detailed review soon. I am amazed by the battery backup of the device, I am getting roughly 3 days battery backup with basic uses, there are 48 apps installed on the device including the preinstalled applications. The company is claiming that the 4000 mAh battery will allow the phone to run for up to 22 days on standby and can also be used as a reverse charger power bank. The overall device performances are good considering its price range and hardware specifications. However, the 18:9 beautiful HD display, dual rear camera and huge battery backup are definitely going to play an important role to drive the buyers’ attention. The device is available exclusively on Amazon from today (December 20) for the price of Rs. 7,999 Rs. 6,999. Apart from Rs. 1,000 instant discount, you can also avail the 90 GB 4G data offer by Airtel.